Available in a variety of colors, Arcadian Audio's Pnoe hornspeaker (�105,000) features an ultra-linear full range driver. Their custom horn cabinet design is uniquely optimized with smooth and round sections to back load the driver. High tech composite construction ensures long life and color fidelity. Your amplifier's output remains pure as there is no crossover network needed for the full-range driver. 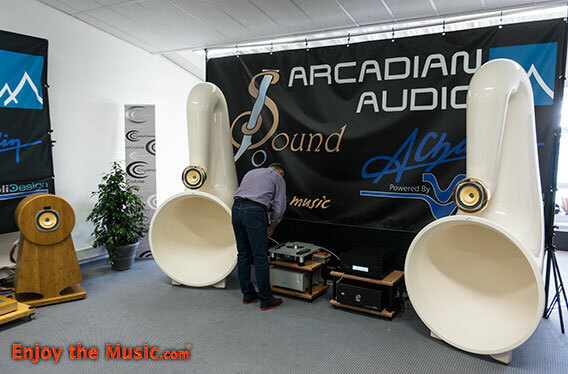 Arcadian Audio's Pnoe horn is the culmination of a 17-year effort to design and realize a horn speaker without compromises. A team of high-end enthusiasts with deep technical knowledge and access to advanced production equipment worked through many stages of design, mathematical and physical simulations, prototype development, and countless hours of listening and blind testing. According to the company, "The sound is extremely dynamic, clear and correct. The bass extension, down to 35Hz, is very fast and totally natural, unlike hybrid box/horn designs or multiple driver systems. The soundstage is wide and precise and the whole experience brings the emotions of a live performance. Voices are simply divine, horns are in the room, and orchestras are alive!" Sensitivity of 100 to 105dB/W is a reality along with a favorable impedance curve, which means the Pnoe is perfectly suited to be paired with the smallest high quality tube amplifiers such as a 300B triode. Pnoe speaker, being a large horn, is more suited to listening rooms with three meters or more distance between the listener and the speakers. Standard internal wiring is Crystal Cable silver/gold. 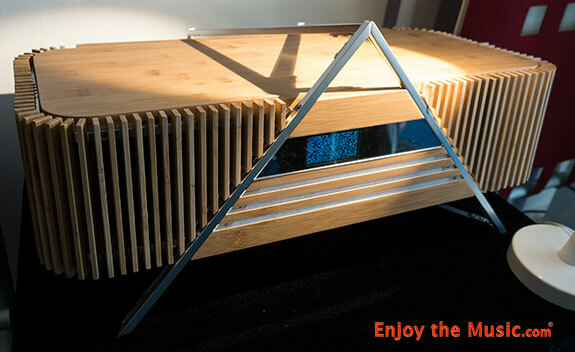 Innovative high-end audio company iFi Audio brought to HIGH END 2018 in Munich their project Glastonbury ($1500) that is close to ready to being serially produced. Think of the iFi Audio Glastonbury as a Bluetooth and Hi-Res Audio compact powered speaker on steroids. All the usual features you�d find on a Bluetooth speakers are there, yet you also get far higher quality DAC, signal processing, and power amplification. Very much look forward to hearing the final production version at shows later this year. While virtual reality has not really been an 'audiophile thing' as of yet, many multi-millionaire and billionaire investors including venture capitalist firms are deeply involved in this impressive technology. At HIGH END 2018 VR glasses were being worn to take a 'virtual tour' of an automobile. 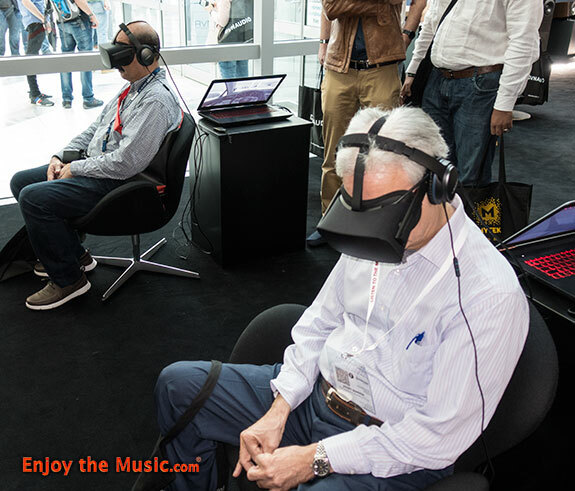 Perhaps one day audiophiles will take to VR as a viable alternative to enjoying a live concert. VR is also great for those with mobility problems yet want to feel as if they are part of the action. 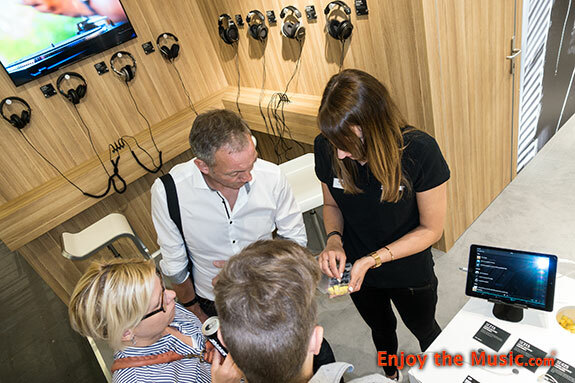 At HIGH END 2018 the crowd kept getting larger and here's a fast photo of how the many high-end audio manufacturers are there to answer your questions. 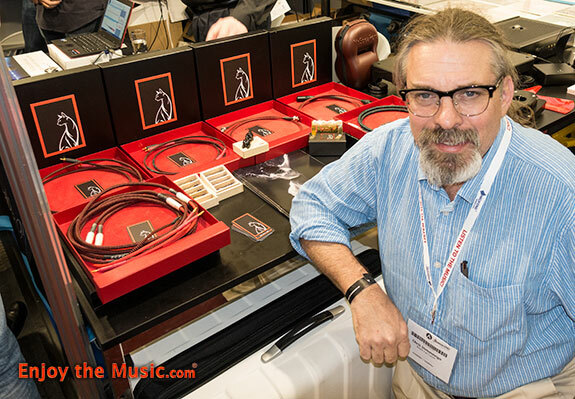 Chris Sommovigo of Black Cat Cable was in Munich showcasing his impressive line of hand-made cables. Many know Chris for his innovative work with digital S/PDIF cables, yet he also has an incredible line of analog signal and loudspeakers cables too. One of Black Cat Cable's the most popular and revered digital connectors is getting an Mk. II upgrade after almost seven years since its introduction! Black Cat's new Silverstar 75 Mk. II digital cable ($222 for 0.5 meter) is a true BNC 75 Ohm S/PDIF design from the originator of the precision-impedance digital cable, Chris Sommovigo. The Mk. II update to this long-lived design incorporates a 'lite' variant of the RF rejection materials employed in both the Digit-75 and, to a greater degree, the TR�N Super-Reference S/PDIF cable.